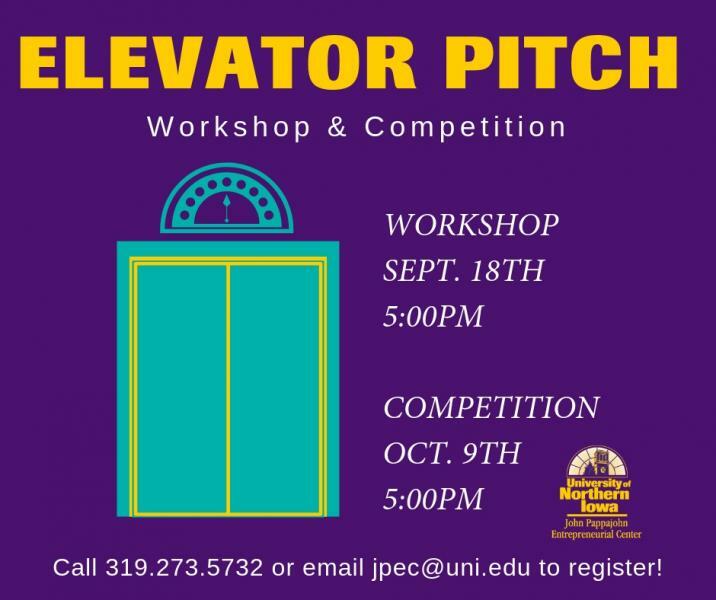 Join us for the Elevator Pitch Competition taking place on October 9th, at 5pm in the Scholar Room at the Rod Library. Cash prizes will be awarded to the first, second, and third place winners as well as 3 honorable mentions. Register by completing the Intent to Compete form attached. These forms are due by Friday, October 5, and they can be emailed to jpec@uni.edu. A workshop will also be offered on Tuesday, September 18th, at 5pm in the Scholar Room at the Rod Library. Laurie Watje will be presenting on how to give a pitch and what criteria you will be judged on for the upcoming competition.